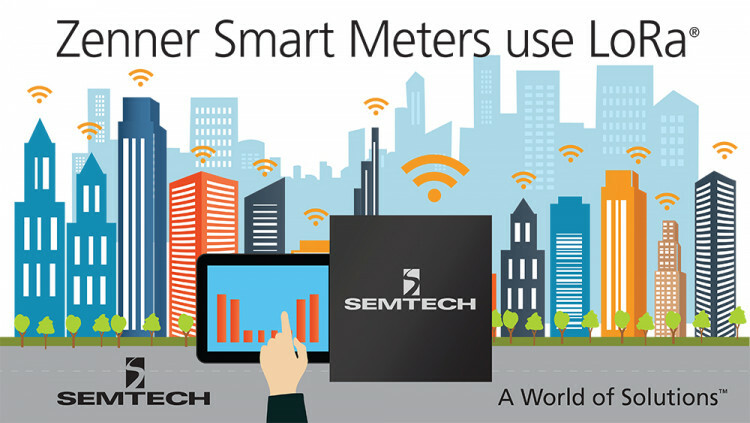 Semtech Corporation (Nasdaq: SMTC), a leading supplier of analog and mixed-signal semiconductors, today announced that Zenner, a global leader of metering systems, will integrate LoRa™ RF technology into their water, heat, gas, smoke and electricity measuring devices being deployed in low power, wide area networks (LPWAN) globally. By using LoRa RF technology and following the LoRaWAN™ specification, which is standardized by the LoRa™ Alliance, Zenner will give its customers the ability to easily integrate its platforms into existing LoRaWAN networks. LoRa RF technology will automate the meter reading process by transmitting data directly to deployed LoRa® gateways or network infrastructure. LPWANs will reduce the overall costs and allow for more frequent and efficient meter monitoring. It will also allow hard to access meters, such as those in shafts or metal enclosures or deep underground, to be monitored remotely. LoRa RF technology is a bidirectional wireless communication solution designed to specifically cater to Internet of Things (IoT), machine-to-machine (M2M) and smart city network infrastructure. The low power, long range technology enables large LPWANs and is able to support millions of end-user devices. Other features, including long battery life and strong security, make LoRa ideal for a diverse range of applications in addition to metering, including smart buildings and appliances, security, asset tracking, healthcare, agriculture and more. For more information about LoRa and the LoRaWAN specification, visit www.semtech.com/wireless-rf/lora. For technical support or general product inquiries check out the LoRa Community or contact Semtech’s support team. All statements contained herein that are not statements of historical fact, including statements that use the words “expect,” “will,” “would,” “allow,” “enable” or other similar words or expressions, that describe Semtech Corporation’s or its management’s future plans, objectives or goals are “forward-looking statements” and are made pursuant to the Safe-Harbor provisions of the Private Securities Litigation Reform Act of 1995, as amended. Such forward-looking statements involve known and unknown risks, uncertainties and other factors that could cause the actual results of Semtech Corporation to be materially different from the historical results and/or from any future results or outcomes expressed or implied by such forward-looking statements. Such factors are further addressed in Semtech Corporation’s annual and quarterly reports, and in other documents or reports, filed with the Securities and Exchange Commission (www.sec.gov) including, without limitation, information under the captions “Management's Discussion and Analysis of Financial Condition and Results of Operations” and “Risk Factors”. Semtech Corporation assumes no obligation to update any forward-looking statements in order to reflect events or circumstances that may arise after the date of this release, except as required by law. Semtech,the Semtech logo, LoRa and LoRaWAN are registered trademarks or service marks, or trademarks or service marks, of Semtech Corporation and/or its affiliates. Third-party trademarks or service marks mentioned herein are the property of their respective owners.